Couples will love fine Italian dining at Il Borromeo, and the hotel’s romantic Belle Époque décor, designed with warm colours, rich fabrics, and Murano chandeliers. 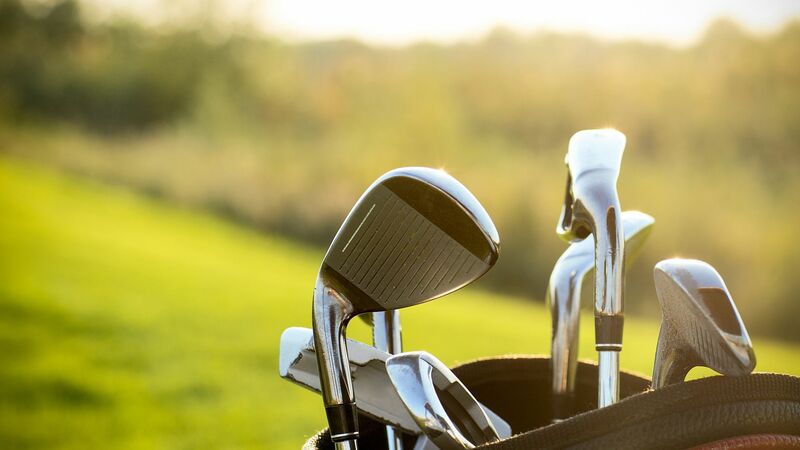 The hotel offers the best in relaxation, but also caters to adventure seekers, with golf courses, water sports, and Alpine hiking on your doorstep. 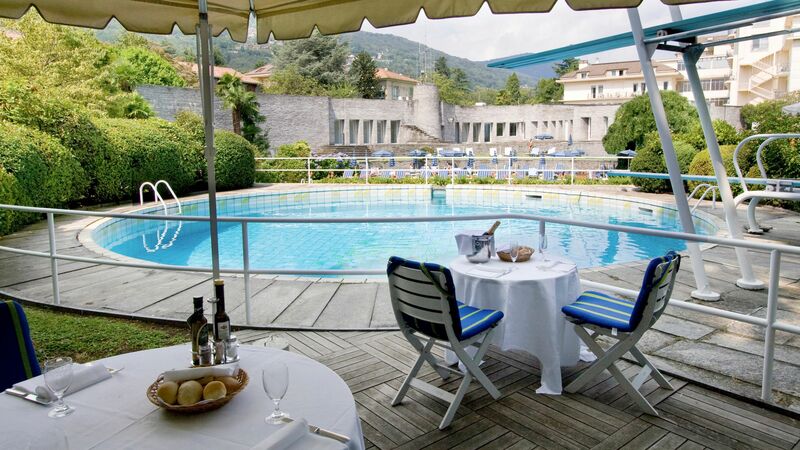 This 5-star property was opened in 1863, and is only a few minutes’ walk from the town of Stresa. Notable hotel guests include Ernest Hemingway and Clark Gable, as this property has been treasured for generations by those seeking romance and relaxation on Lake Maggiore. The hotel has 179 rooms. Child prices apply to ages 2–7 years. Breakfast is served buffet style, offering both cold and hot dishes, and lunch and dinner are served a la carte. Fine Italian cuisine, with an emphasis on local produce, and local wines are available. In the warmer months, terrace dining is available, and offers fantastic views of the lake. Open: 7:30 – 10:30, 12:30 – 2:00, and 7:45 – 10:00. Pick up refreshing snacks, drinks and light meals after long lazy days soaking up the sun at the hotel’s pool bar. 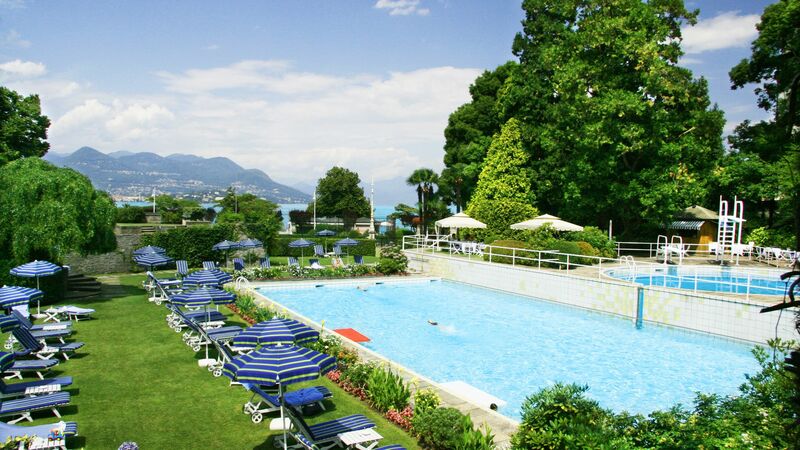 A large outdoor pool, with views of the lake and Alps, is open from May to September. A poolside snack bar is also open within the summer season, and sunbeds, umbrellas, and towels are provided. 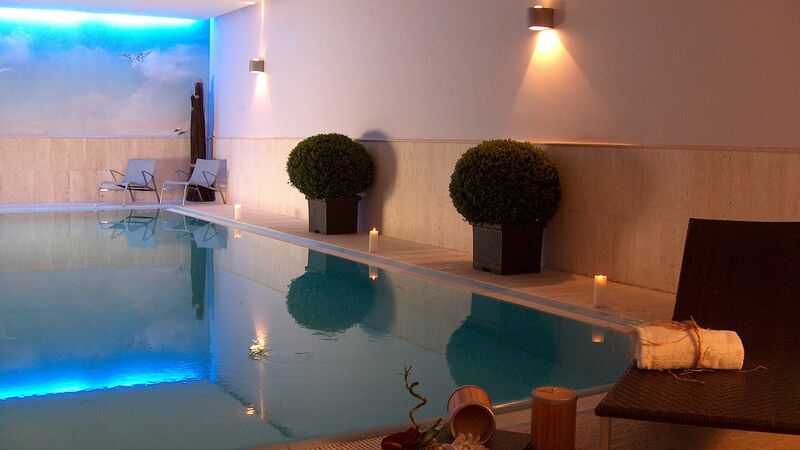 There is also a separate diving pool and an indoor pool is available within the Spa complex. 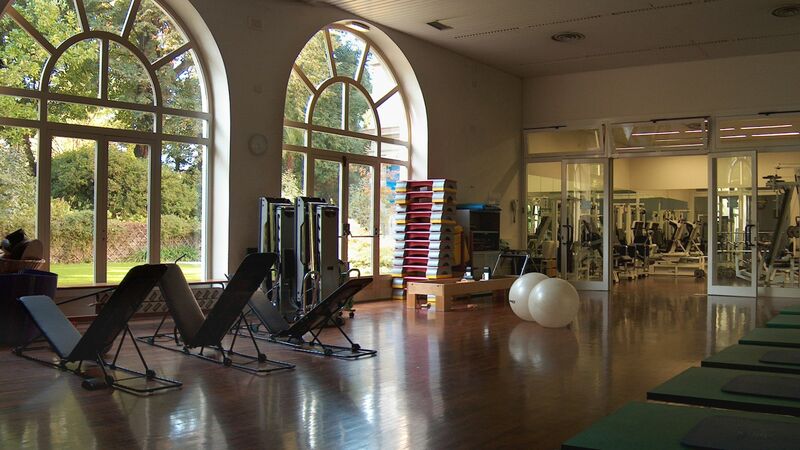 Keep fit during your stay with the hotel’s state of the art equipment which is available in the fitness centre. You’ll find both cardio and strength training facilities available. The Grand Hotel Des Iles Borromees’ five star spa provides a range of indulgent treatments, including massage, facials and beauty treatments. A heated indoor pool, sauna, Turkish bath and relaxation room with herbal teas are also provided, as well as robes, towels, and slippers. The hotel offers complimentary bicycle hire and tennis courts, perfect for those wanting to keep active during their stay. There are two nearby courses: Golf Des Iles Borromees, a 18-hole, Par 72 course, and Golf Alpine, a 9-hole, Par 69 course. The deep blue waters and soaring mountains of Lake Maggiore are both awe-inspiring and beautiful. Lake Maggiore offers the best of both the Italian and Swiss Alps, offering hiking, history and culture, and islands to explore. The main village is Stresa, on the lake’s western shore, tucked into Borromean Bay. Fly up in the Mottarone cable car for a birds eye view of the Alps and the lake, stroll through the area’s 19th century villas and gardens, or simply relax with a lakeside aperitivo. Maggiore offers the quintessential Italian lakes experience, with dramatic views, a blend of Italian and Swiss culture and luxury accommodation from a foregone era. 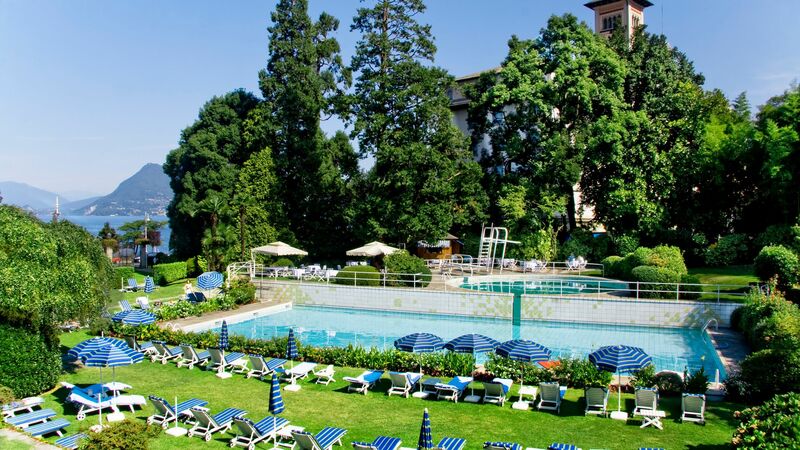 Grand Hotel Des Iles Borromees is one hour from Malpensa Airport. Twin Garden View Rooms are comfortable, elegant, quiet and enjoy the sight of the luxuriant park of the hotel and of the mountains surrounding the Lake Maggiore. Most of the garden view rooms have a balcony. All rooms have either a king-size bed or twin beds and can sleep up to three adults. Facilities include a marble bathroom with whirlpool bathtub, safe, complimentary Wi-Fi and satellite LCD TV. Twin Front Lake View Balcony Rooms provide comfort, space and an unrivalled view on one of the most beautiful lakes of Italy. All rooms have either a king-size bed or twin beds and can sleep up to three adults. Facilities include a luxury marble bathroom with whirlpool bathtub, safe, complimentary Wi-Fi and satellite LCD TV. Junior Suites Front Lake View/Balcony have lake view and feature a king-size bed or twin beds and a living area with breakfast table. They can sleep up to three adults. Facilities include a luxury marble bathroom with whirlpool bathtub, safe, complimentary wifi and satellite LCD TV. Stay for 7 nights and pay for 6 nights or stay for 14 nights and pay for 12 for holidays between 03 May - 11 October 2019. Get a lakeside room. The view is fabulous n we had two balconies with bistro sets. Lovely closet. Beautiful two sink bathroom with turn down service that is more than the bed. Very well maintained room n hotel. Belle ? ?poque but excellent condition. Great helpful staff. We had a delightful stay here for three nights. 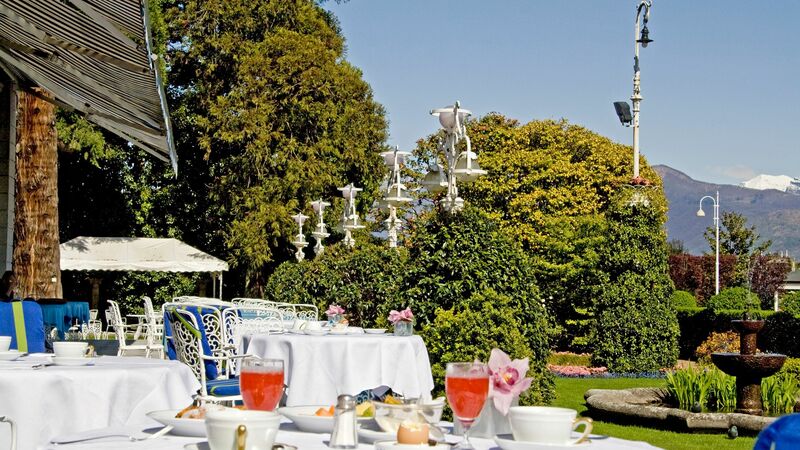 It is a short walk into Stresa and it is surrounded by beautiful gardens. Rooms: comfortable beds with rock hard pillows but one can ask for other types of pillows. We stayed in a lake view room but quite honestly I would ask for a garden view room next time as the road can be quite noisy. There is a bar fridge but no coffe or tea making facilities. Bathroom: double basins, bath with overhead shower, toilet and bidet. Lovely big fluffy towels and bathrobes. The toiletries have been created by the spa and are very nice. Breakfast: the breakfast is excellent for Italy with a wide range of cheeses, meats, salmon, cereals,yoghurts, pastries, bread, boiled eggs, bubbly and fresh fruit juices. Spa: the spa has an amazing selection including Drs for botox and fillers. There is a wide range of beauty and anti-aging treatments. The only thing I found to be mediocre was my foot massage, and expensive at 60 Euros for 30 minutes. There is also a gym, outside pool and indoor warm pool. Staff: the staff are friendly and helpful. The waiters get to know you and one is welcomed with warm smiles. Restaurant and bar: The breakfast room become an elegant dining room in the evening. The food and wine lists are exceptional. Service is exactly as one would expect in a fine dining restaurant. Our only niggle was being asked to dress elegantly for dinner which we happily did, only to find others had been allowed entry in tracksuits and t-shirts. It spoilt the elegance of the restaurant a little! The bar was a little disappointing although we did have pre-dinner cocktails here on all three evenings. It lacked ambience unless someone was playing the piano. Drinks are excellent, expensive and rather small compared to anywhere else in Stresa! I would happily stay here again. This is the hotel that Ernest Hemingway stayed in when he wrote A Farewell to Arms. We were staying in Stresa & decided to visit the hotel. It's Old World style but is not run down. The gardens outside are also worth walking through. Walking toward your room is like walking through a museum. Walls have mirrors, paintings, statuary, and similar artwork. The bar is named Hemmingway to acknowledge his writing of Farewell to Arms. Located across the road from Lake Maggiore, the boats to travel to the islands are quite near. Breakfast is excellent following upon the European tradition. Just loved staying at this hotel, which is good job as I was very ill during our stay here and barely left the hotel room. I managed to venture down to 'watch' my husband eat on the Saturday night and was late for breakfast Sunday morning, so only managed a couple if mouthfuls. Sob, sob... Staff were fantastic and sent up teas & coffees to our room. Didn't manage to use the Spa unfortunately as was too ill. Such a shame, as we had booked this hotel to celebrate my 50th Birthday! However, things don't always go according to plan. At least our room was fantastic, and I can think of worse places to be ill! !